We’ve been delivering quality chiropractic care to the Keyport/Bayshore area since 1986. We encourage ourPatient to achieve the highest levels of health they can. Through educational opportunities (like this website), we hope to communicate the value of ongoing chiropractic care. Our desire is to see our Patientabandon the prevailing sickness care model of health (waiting for symptoms and then taking action), in favor of the emerging wellness model. Sound interesting? 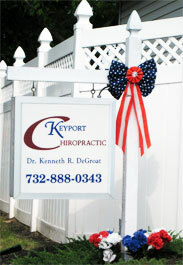 Please contact our Keyport chiropractic practice to make an appointment.